An extraordinary diversity of plants has evolved on the nutrient poor sandplains of Western Australia. In this book you can find sixty of the most extraordinary. They can be found from Kalbarri to Esperance, but all occur in the coastal country just north of Perth on the site of the Gravity Discovery Centre. 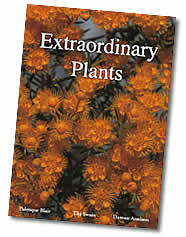 The book combines photos by Damon Annison with a jargon free text that introduces the plants from Aboriginal and Western botanical perspectives and discusses their uses, their botany, their ecology and their extraordinary adaptations. Aboriginal Nyungar names are listed with common names, scientific names and family information. Photographer Damon Annison, is a keen environmentalist, with a particular eye for landscapes and detail. Palenque Blair is a botanist by training, and at heart. Tiki Swain is a science communicator who volunteers as a guide at Kings Park in Perth and is fascinated by her home state of Western Australia.